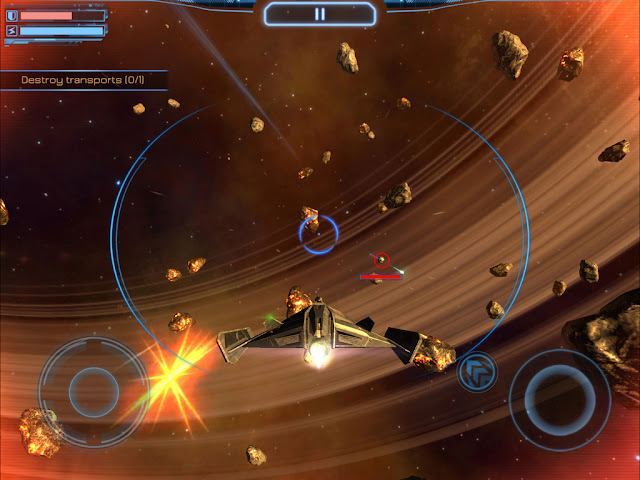 A week doesn't go by without a huge pile of new games being released on Apple iPad. And, of course, there's so much of it that is instantly forgettable, or downright terrible. But there's also a lot of stuff that is really, really great. This week, in our short 'n sweet reviews, we take a look at some of the games of note that have recently been released on Apple iPad. In case mobile gaming avoided you these past three years, Monument Valley was an Escher painting come to life type of a puzzle game that has you take the hero character through its surreal mazes. My first reaction, upon hearing the originality inspiring title of its sequel, “Monument Valley 2”, was to shudder at the thought of being asked to fork out more for what will probably feel like just another DLC. Fears further develop upon hearing the main trick up the sequel’s sleeve is to do with the player controlling two rather than one characters. Can a sequel rely on simply more of the same to justify its existence? Well, I am here to tell you Monument Valley 2 gets away with adding little in the way of new mechanics, and very eloquently so. Getaway is achieved through the narrative: Monument Valley 2 offers a statement on parent to child relationships and this thing that The Lion King referred to as “the circle of life”. 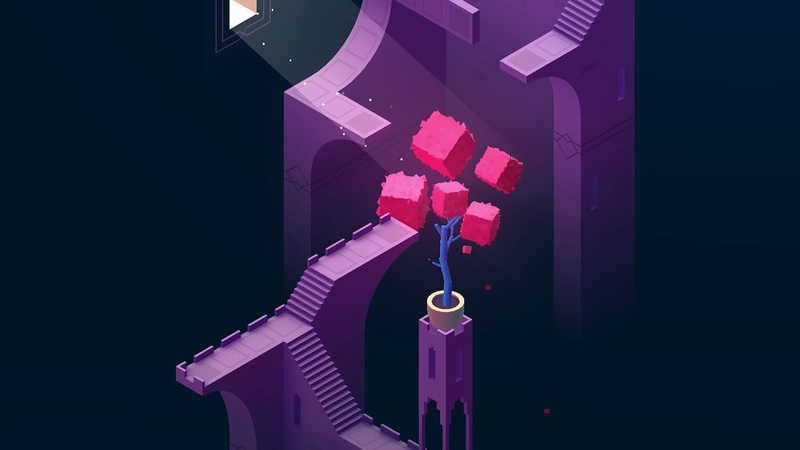 Through the developing story, the cute characters, and the wonderful ways in which you control them (which vary as the child grows), Monument Valley 2 aims to provide what is commonly referred to “a spiritual experience”. I am way too much of an old cynic to subscribe to such notions, but I will admit this game is a clear and blatant example for a work of art. Between its game design, spectacular visuals and moody soundtrack, there is simply no escaping the fact. Like its predecessor and its DLC, Monument Valley 2 is a short game (say, two hours?). Personally, I do not consider this a disadvantage; on the contrary, I like games that do not pull their punches. I do not need time fillers, thank you very much; I plan on only living once but making the most of that opportunity. Monument Valley 2 certainly deserves a spot in my short but rich life. For some, 4D Toys will challenge their preconceived notion of what a video game is. That’s because not only doesn’t it ask you to kill or even hurt anything and anyone, there is no real goal to achieve here; 4D Toys is, essentially, a guided playground aimed at improving the player’s perception of what a 4D universe would be (is?) like. In more than one respect, 4D Toys follows on the steps of Edwin Abbott’s book from 1884, Flatland. That book follows a 2D being living in a 2D society as he bumps into a literally groundbreaking being from the third dimension. Indeed, 4D Toys starts off with an overview covering off Flatland’s turf. The difference is, Flatland seeks to explain the concept of multi dimensions to us three dimensional beings by presenting us with a two dimensional universe we can imagine with relative ease (the book also represents a discussion about the social class system, but that’s another matter for anther time). 4D Toys aims higher: it aims to explain what a four dimension world would be like by utilising the latest technology (a touch screen enabled device harbouring advanced processing power) in order to physically present us with digestible 3D projections of such a world as well as [roll the drums!] let us actually have a bit of a play in this world. Maths lessons do not come any better than 4D Toys. If ever there was a good justification for a game, 4D Toys nails it! Sure, no matter how much I play around 4D Toys, I'd be lying if I said I have achieved intuitive understanding of what a 4D world would feel like. Thing is, whenever I find myself grappling with another question, I just go back to the playground and toss another ball or twist another shape to witness, with my own eyes, what’s actually happening. This is as good as it gets, at least until we get 4D Toys’ augmented reality version. Sure, 4D Toys may not provide the visceral excitement that run of the mill video games provide, but that is exactly the point: it is not a run of the mill game; it goes an extra dimension or two further. Starmaster, a game from a promising young company called Activision, hit yours truly and his Atari 2600 many decades ago to deliver plenty in the dream fulfillment department. Here was a game that made me feel I was a Luke Skywalker duelling space in World War 2 style dog fights that don’t really make sense but are pretty cool nevertheless. Fast forwarding to modern times, and I will go on record stating I believe Star Wars: Battlefront delivers the best of that WW2 space dog fighting experience to date (albeit in what is an otherwise dismal affair). The catch is in the realm of the mobile: the closest to the Red 5 experience is probably Galaxy on Fire, but that series suffers from the illnesses of the in app purchases / online only business model. The latter’s problem appeared to have been potentially solved with the recent release of Subdivision Infinity, a game released on the premises of “buy once and only once”. As a bonus, it threw in Apple TV support. After all this long introduction, I now have the problem of explaining to you exactly why Subdivision infinity fails with the task on its hands. The problems start with the story and the characters that lead the player through the missions; these are as flat and as cliche as. Then we get to the missions themselves: some of them do sport cool space staged dog fights, but many don’t; instead you’re sent on tedious “find the missing object” exploration missions or mining missions that are nothing but meaningless fillers and often take literally seconds to achieve. In between missions you get tons of menus to grapple with as you go here to claim this reward for that and go there to claim that reward for this. There is a very predictable formula to everything, from the missions to the grinding that takes place in between, and the whole thing just feels like a pointless waste of time better spent dog fighting. What beggared my belief is the question of why this “buy once play forever” game utilises all the cheap and nasty tricks from the freemium books. I can only conclude there is a core design problem with Subdivision Infinity, perhaps to do with it originally being conceived as freemium but then turned into premium due to rival releases. Regardless, the end result is a very mechanical affair of short dog fighting followed by lots of tediousness for the sole sake of getting a slightly better ship with which to fight slightly superior enemies in the next round. In the year of our Goddess 2017, this - Subdivision Infinity - is simply not good enough. If I had to summarise the Poly Bridge experience in one sentence, it would be “the joy of failing”. Given my personal aptitude in the field of failure, one can clearly see the appeal such a game would hold for me. More to the point, having played Poly Bridge for more than a year now on PC, I uncorked the expensive champagne (the original French, not the imitation one) when Poly Bridge came out on iOS. That’s because, as everyone should know by now, PCs are so twentieth story (he said while ducking for cover). And also because Poly Bridge is exactly the type of game that would work best on mobile. 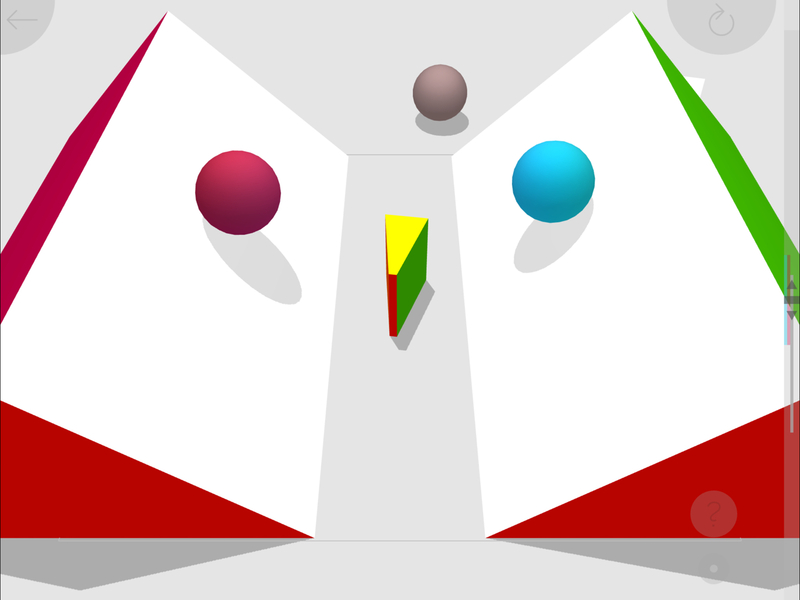 In the remote chance Poly Bridge was unavailable at the far far away galaxy you’ve spent the last year at, I will let you know this is a puzzle game offering a low three digit number of levels. Each of these involve a river, cars and other modes of transportation that wish to cross it, and you as an accredited bridge builder with a limited budget with which to help said cars fulfill their life’s mission. 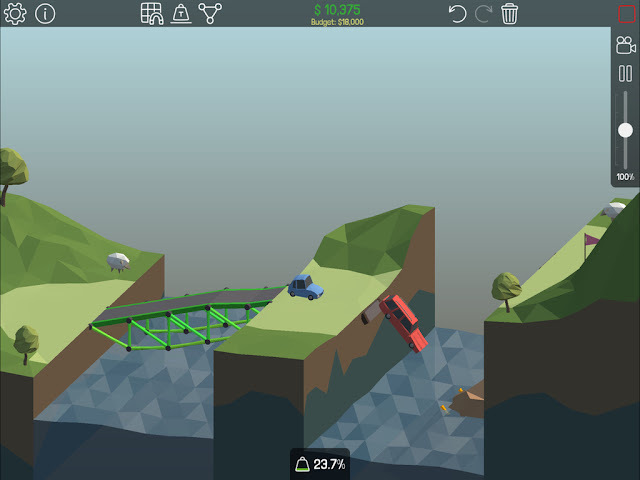 If it sounds similar to Bridge Constructor then you’re absolutely right, though I would argue Poly Bridge takes things a notch further in the presentation department. Further on the inferiority of PCs, drawing a bridge with one’s finger makes much more sense than clicking it off. The superiority of modern user interfaces aside, the real joy to be had with Poly Bridge is to do with getting away with the cheapest bridge one can get away with. Inevitably, this approach will lead to many a car spectacularly plunging to the depths (not to mention collapsed bridges). The contrast between the horrific events and the happy colourful graphics, mixed as they are with an easy going cheerful soundtrack, is the source of magic that is Poly Bridge. Truly one of the best gaming experiences on mobile.